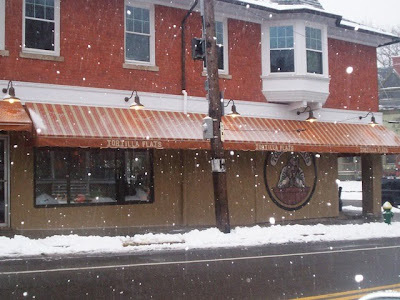 Thanks to a gracious donation and suggestion from our fan Jodi, Mom and I found ourselves heading to Providence in the midst of a snowstorm to visit Tortilla Flats, a fun little Mexican restaurant on the corner of a busy street. At first I was stressed over the parking, but was lucky enough to score a spot across the street in front of the Jewish Hospitality Center (and hoped that they were, in fact, hospitable enough to let me stay there). 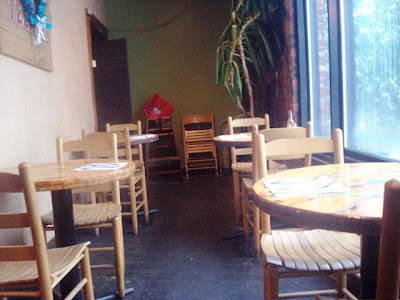 We entered the restaurant at around 3:30 p.m. When we got inside, we were greeted by a waitress, who we later learned was named Cassie (and who reminded me of my cousin Sherri). Mom asked for table, so she led us to a cute area at the back of the restaurant and put us at a table by the window. We were given two colorful lunch menus to look over as we struggled to take off our winter gear. Cassie returned to the table to take our drink order - two Diet Cokes ($1.75 each). I am really into Mexican food, so of course, everything on the menu looked good. Mom is a little more reserved because of her hate-hate relationship with vegetables, but was still able to find several dishes that she wanted to get. When we had finally narrowed down our choices, Cassie returned to place the order. Mom chose the pulled pork wrap ($7.99), while I went with the Baja tacos ($11.95). 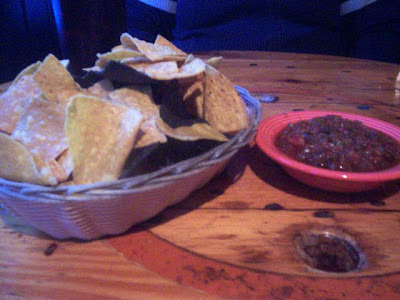 After Cassie left the table, I realized that I had forgotten to order the jalapeno salsa and chips ($2.50) as an appetizer. Cassie returned and asked us what kind of salsa we wanted - mild, mixed, or hot. At first we went with mixed, but Mom wanted to try the hot, so we went with that. Boy, when they said hot, they meant it! That salsa was extremely hot and delicious. Thank God for the sodas because Mom and I kept having to take sips of it to cool our mouths down. The chips - a mix of regular and blue corn tortilla - were tasty and crunchy. A great start to any meal! As we waited with inflamed mouths for our entrees to arrive, we took a few minutes to check out the restaurant. It is very trendy, and we can see why the college set likes to come here for drinks. The restaurant was dark, so I apologize if the pictures aren't that good. 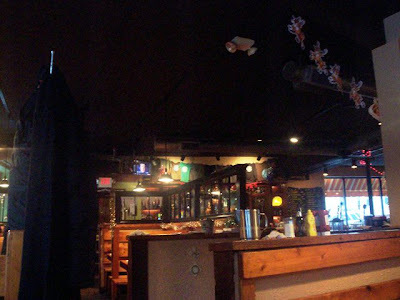 There was a large flat screen on the wall pointed toward the bar area, and several booths and tables scattered throughout the restaurant. The decor was typical of a Mexican restaurant - lots of eclectic art, pottery, and strings of lights. There were also some t-shirts hanging along one wall, and many Christmas decorations that actually fit right in with the crazy theme. Overview of the main dining area. 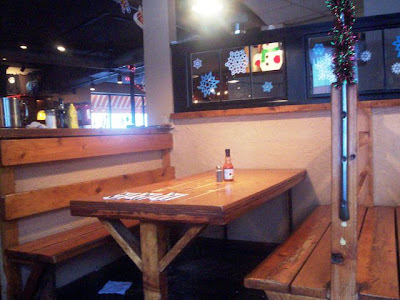 One of the cute wooden booths. We hadn't been waiting long before our food arrived. Both plates looked fantastic. 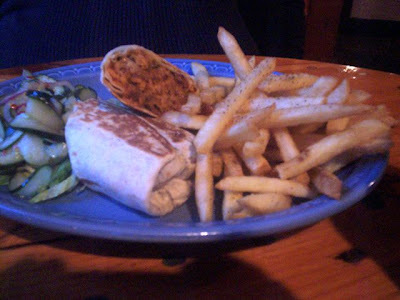 Mom's pulled pork wrap came with a side of peppery fries and a cucumber salad, which she slid onto my plate. Mom was very pleased to find that her wrap was filled to the brim with tender, sweet pulled pork mixed with a layer of cheddar/jack cheese. She also enjoyed the fries, which were thin, crisp, and nicely spiced with salt and pepper. It was a very filling and tasty meal. My fish tacos were outstanding. They used tilapia, which is a type of fish that I don't normally care for. However, when mixed with other things, tilapia can be quite tasty. 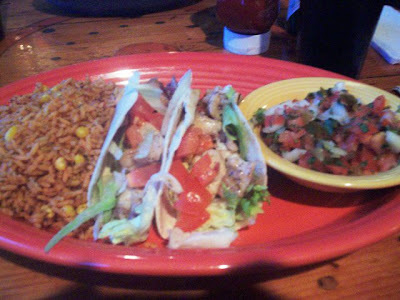 This particular tilapia was sauteed with garlic, red onion, and white wine, and served inside two soft shell tacos stuffed with lettuce, tomato, and chipotle ranch dressing. The dish also came with a side of pico de gallo and rice. The only downside to this dish was that I could have used less of the rice and had another of the delicious tacos. They were stuffed beyond capacity, and the ingredients were fresh and tasty. The rice was good, but I'm not that big on rice. It's just a personal preference. I say add one more taco to that plate and it will be all the more fantastic! 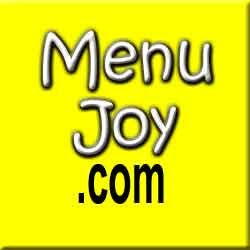 A great price for a great meal. I left $34 on the table for Cassie, which included a 20% tip. She was a great waitress! Before heading back out into the snow, Mom and I used the ladies' room. It was very clean and organized. After climbing over a pile of snow and almost getting killed by a plow barreling down the street, we were safely back in the car. We'd like to thank Jodi for the great suggestion and for donating her hard-earned cash to support our site. The next time we visit Tortilla Flats, Mom said that she is going to try their bison burger. Mom? Eating bison? What else will 2010 bring? Tortilla Flats is open from 11:30 a.m. to 1 a.m. Monday through Thursday, 11:30 a.m. to 2 a.m. Friday and Saturday, and 1 p.m. to 1 a.m. on Sunday.